Traumatic brain injury (TBI) can cause widespread and long-lasting damage to white matter. Diffusion weighted imaging methods are uniquely sensitive to this disruption. 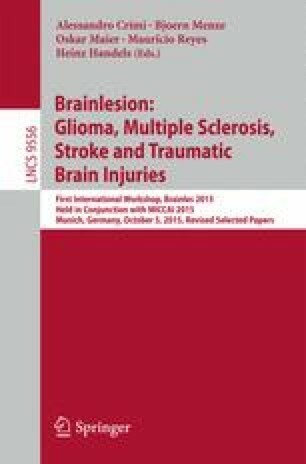 Even so, traumatic injury often disrupts brain morphology as well, complicating the analysis of brain integrity and connectivity, which are typically evaluated with tractography methods optimized for analyzing normal healthy brains. To understand which fiber tracking methods show promise for analysis of TBI, we tested 9 different tractography algorithms for their classification accuracy and their ability to identify vulnerable areas as candidates for longitudinal follow-up in pediatric TBI participants and matched controls. Deterministic tractography models yielded the highest classification accuracies, but their limitations in areas of extensive fiber crossing suggested that they generated poor candidates for longitudinal follow-up. Probabilistic methods, including a method based on the Hough transform, yielded slightly lower accuracy, but generated follow-up candidate connections more coherent with the known neuropathology of TBI. This study was supported by the NICHDS (R01 HD061504). ELD, YJ, and PT are also supported by NIH grants to PT: U54 EB020403, R01 EB008432, R01 AG040060, and R01 NS080655. CCG is supported by the UCLA BIRC, NS027544, NS05489, Child Neurology Foundation, and the Jonathan Drown Foundation. Scanning was supported by the Staglin IMHRO Center for Cognitive Neuroscience. We gratefully acknowledge the contributions of Alma Martinez and Alma Ramirez in assisting with participant recruitment and study coordination. Finally, the authors thank the participants and their families for contributing their time to this study.